All five of our rooms are double bedded with full en-suite facilities. Free Fibre Optic Wi-Fi available for guests. 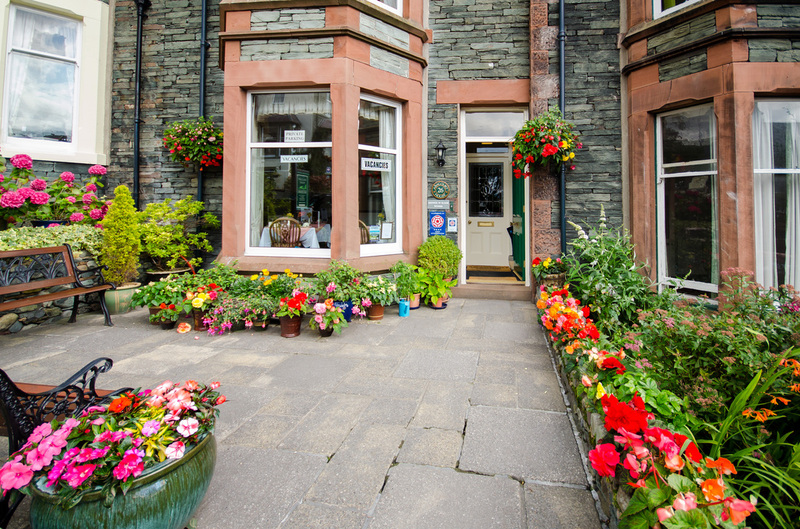 Abacourt is situated very close to the centre of Keswick, just less than 2 minute walk from its many shops, cafes, bars, restaurants and numerous other attractions and amenities, yet we are located in a cul-de-sac which makes for quiet evenings. Our elevated offers great views, especially from the patio. Abacourt is strictly a non-smoking guest house and this also applies to the outside paved patio area and path leading up to the guest house. Any guest found to be smoking will be required to leave and pay their bill in full. We are unable to cater for children under 13 or pets. Keswick is 18 miles from the nearest train station at Penrith. The bus to Keswick from Penrith stops at the train station approximately hourly. Local taxis are available to and from Penrith. Bus Station by Booth’s Supermarket, approximately 5 minute walk. 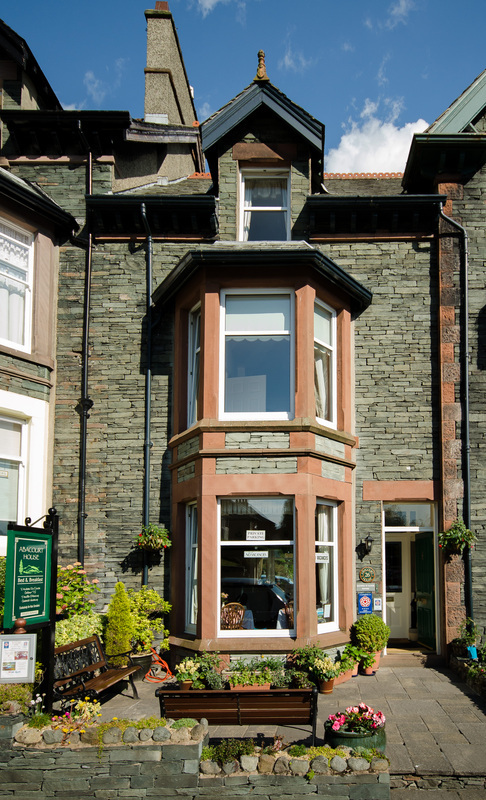 Abacourt is close to the centre of Keswick, approximately a 2 minute walk. There are no bedrooms or toilet facilities on the ground floor. Abacourt is not suitable to wheel chair users or those unable to climb stairs. Abacourt has a private car park at the rear of the property. Reached by a lane 15 meters above Abacourt. Turn right into the lane, immediately turn right again, passing through the first parking into a narrow gap and the Abacourt parking area. Large cars to the left, small medium cars to the right. There is a height restriction of 2 meters (6ft 6”), too this parking area, as you will drive under laundry lines. Parking on a first come first serve basis. Parking for 4 to 5 cars, dependent on size. Spaces cannot be reserved. Unrestricted on street parking is available. There is no rear access for guests. Access for guests to Abacourt is made by the main front door. We ask guests to offer an estimated time of arrival so we can be on hand to help guests with their luggage. We are always here when guests arrive to welcome them and assist with parking and luggage that may need to be carried. The luggage is brought through the owner’s private rear entrance by the resident owner. There are 2 steps from the sloped pavement to a level paved patio area 1st step height 26 to 11cm. 2nd step 27cm. Abacourt has only one entrance for guests; at the front of the house. The paved patio has bench seats for guest use. The front door has a small step 14cm which leads to a Vestibule 1m 55 x 1m 25. The front door is width 80cm. The Vestibule door width 76cm. Bells to ring for attention are situated beside the main outside front door and also by the inner vestibule door. Hallway 3m 50 x 1m 25 with a central heating radiator and reception bureau. The Vestibule door is closed at all times for security. Guests are given one key to the house and one to their own room. The main outer door is closed in the evening. There is no seating at the entrance. All stairs are 18cm high. 6 stairs to the second floor with 2 bedrooms. All landings are well lit. Abacourt has no lift or stair chair. All guest bedroom doors are 76cm wide and close automatically, they are locked with keys provided to each guest on arrival. Wall to wall carpeting throughout. All stairs have solid wood banisters on the left side and the wall on the other. They do not have banisters on both sides. There are no public toilets. Each guest room has its own en-suite. All landings are well lit and equipped with emergency lighting. Smoke detectors and fire alarms are fitted. Fire alarms are siren type. There are fire extinguishers on the ground, first and second half floor landings. There are fire notices in every bedroom with evacuation procedures. next to each fire alarm on the first and second floor landings and the hallway. The breakfast room is on the ground floor and is brightly lit, with gas fire and central heating. Tables are set for two and there is no set seating arrangement. Tables can be moved to accommodate parties of 4 or 6 covers. All chairs have seat pads. Individual printed menus are on each table. We cater for vegetarians and special dietary requirements, Coeliac etc. The bedrooms are not suitable for wheelchair use. Entrance to all bedrooms are wooden single leaf, key operated doors. All rooms are 100% carpeted. Smoke detector in each room. Double bed, wardrobe, drawers, hospitality tray, glasses and water, tissues, remote control LCD TV, clock radio, bedside touch lamps, hairdryer, individually thermostatically controlled radiator. All en-suite have a vinyl flooring. Natural and uniformed ceiling lighting. The showers have a opening swing door. The water temperature is thermostatically controlled via settings chosen by the guest. Wash basin with hot and cold tap, hand wash lotion, mirror and light above, razor point. The toilet is a standard toilet with flush handle. The paved patio to the front of Abacourt has bench seats for guest use. The paved patio area is strictly no smoking. Abacourt does not have a public laundry. The nearest laundry is approximately 350m and is coin operated or a laundry service is available if you wish to collect finished laundry later. There is a full Fire Risk Assessment in place at Abacourt House. Fire Extinguishers serviced yearly, inspected monthly. Fire Alarms serviced every six months, tested weekly. Medication can be stored in the owner’s fridge if required.